How Long: Since BloodScape was born! About me: I'll start off I was one of the first people to have a 317 that wasn't leeched from hell and back. I was a pretty descent client coder in the 317 time. I was the first server to have real runescape bounty hunter skulls as a pking skull or as any skull fully added and coded by me I also wrote the first bh skull for a 317 client tutorial ever! I also was one of the first people with a J Frame with music and slimmer look added I coded smaller parts of it but I mostly have Galkon from runeserver to thank he was the one who found it and release the raw material for people to add on and code. I also had pre modle banks and altars added before anyone else most credit for the model was to whoever made them they were great I was one of few who knew how to and and use them! Humm Well I really loved being a host of a great server that people loved to play. unlike most servers i loved to get to know my players they weren't just another player they were people I got to know, ask any of the original 317 player they will tell you iI would just teleport next to a player and hang out with them and skill or fun pking or just talk at random.Most people were awesome then some were all freaked out by the owner coming up randomly around them and some would ask for something and I run a fair and clean server I will NOT change that, And you dont have to worry about being in trouble unless I bring someone else with me=p. 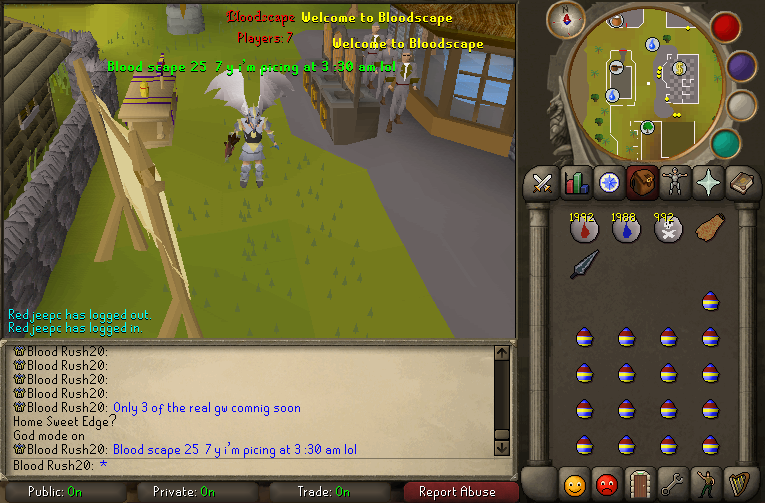 Changed my name since then, but im glad you decided to make a new server Blood. Ah, I was one of the co owners, aka Hi Mannnnnn. Hey if you don't mind me asking, could I manage the forums? I kinda asked this about the last one but never got an answer. Only reason is I'm pretty good with forumotion boards and because I wanna make the forums a bigger place for the server. lol, yeah, just wanted you all to wonder for a while. Alright. Thanks for considering it. I do too, but i never use that YT account anymore.